We have adopted some cats this year and had some wonderful people bring down supplies. Supplies are always needed – so if you are coming down. Aruba Kitten Rescue has changed our mission that we will only continue our hotel cat rescue program. Carriers and harnesses can be dropped off and picked up at Veterinaire Kliniek Noord which is past the light in Noord and at Contreras Veterinary Services which is very close to the hotels too. The vets will also assist with doing the checkup and issuing the paperwork needed. We don’t get many cash donations, so most of that goes towards our vet bills. 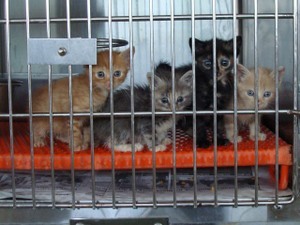 We are sorry that we have no facilities or people willing to foster kittens. Therefore, if you have found a kitten or cat that you can not adopt to take home you will need to look to other rescue organizations in Aruba. Eric De Cuba and the Contreras’ family have been wonderful these past years assisting us with our adoptions and we are so glad that both vets has agreed to continue this wonderful program. We would like to also thank Kiki from FCA for helping us out with our efforts too! information. They are able to board cats over the weekend where the other vet can not. Due to a family emergency, our availability will be limited for a while. We still have other people that can help out for a hotel or kitten rescue. But if it takes a little while for a response, please bear with us. wanted to thank Chadd and Yessy for helping out. Chadd you are a total angel in my book for everything you did to unite this kitten with her new home! I just can’t thank you enough! 1. My daughter & I picked her yesterday a.m. in Corning NY. Chadd and his wife were kind enough to drive her up to Corning NY where we met and took her home to Buffalo. Aurora, now known as Trixie, is just a little tiny thing! She slept most of the 2.5 hour ride home to Buffalo. She is a sweet little girl–full of energy and play, which she did most of the night last night until she got exhausted and curled up next to me to finally sleep. I want to thank all of you for all you have done to let me have the pleasure of giving this little girl a home. Trixie will be well-taken care of and share the house with my four cats and German Shepard, Sasha. As soon as Trixie sits still long enough for me to get pictures, I will send them on to you both. to see this tiny, tiny cat chase this big German Shepard. Mickey Mouse Club – all adopted! Belle and Mickey have just been adopted by a nice Dutch couple on the island. Aurora is going to have a new home in Buffalo NY thanks to Chadd who volunteered to fly her back with him around the 19th! So a happy ending for the Mickey Mouse Club. This is going to be our last batch of kittens because we lack people who will foster kittens on the island. If you can foster for us, please contact me. We still are active for hotel cat adoptions and will help out kittens when we have the resources to do it. We are still hoping our spay/neuter program will work out but need donations in able to do this important work. We have 3 kittens left that need homes urgently. We can’t keep them at the vet for much longer. would like to rescue a kitten needs the chance of a loving secure home! Note Tinkerbelle (the grey kitten) has found a home in Aruba. Please contact us at info@arubakitten.org. if you can open your hearts and home to an Aruban kitten that would love to be yours! These furbabies are about 4+ weeks old. They were abandoned at the vets office. Their mom was tested and has no diseases she could pass onto the babies. The vet says they are healthy. We don’t know the sexes of them yet. They will be available for adoption around 9/24. We need names. They are named after their mom who was called ‘Micki’. Micki has been spayed and is going to a new home. The kittens are eating on their own but need a good home where they will be loved! Here are some updated pictures from the Office Kittens new owners. We see that they have completely settled into their new happy lives! Thank you to everyone involved in this big effort! Yesterday, Sherry delivered the last of 2 of the office kittens to their new parents. They are overjoyed with their new babies and thank everyone involved for their help with this rescue. They just posted this yesterday and i’m sure we’ll get pictures and updates soon! We’re home with our new little bundles of joy and fun. I’ll post some pics later but they are a blast and even though we just have them in the kitchen for now, they think it’s HUGE. Mango already used the potty, we’re waiting for Coconut to go now. They love all their new toys. Coconut purrs like you wouldn’t believe. It’s been 1 month waiting for them and it was definitely worth the wait. I can’t thank you both enough for helping us get our new little Aruban furbabies. Mango and Coconut are leaving today for the DC area and then will go to their new home in NJ! Melissa and her husband have been anxiously awaiting their new ‘arrivals’. They have set up toys and everything they need for them to live a very happy life. We have been promised pictures and an update when they arrive and will share their ‘adventures’ when we get them.